How does a sand filter clean my pool water? Your filter uses special sand to remove dirt particles from pool water. Filter sand is loaded into the filter tank and functions as the permanent dirt removing media. The pool water, which contains suspended dirt particles, is pumped through your piping system and is automatically directed by the patented filter control valve to the top of the filler tank. As the pool water is pumped through the filter sand, dirt particles are trapped by the sand bed, and filtered out. The cleaned pool water is returned from the bottom of the filter tank, through the control valve and back to the pool through the piping system. This entire sequence is continuous and automatic and provides total recirculation of pool water through your filter and piping system. After a period of time, the accumulated dirt in the filter causes a resistance of flow, and the flow is diminished. This means it is time to clean (backwash) your filter. With the control valve in the backwash position, the water flow is automatically reversed through the filter so that it is directed to the bottom of the tank, up through the sand, flushing the previously trapped dirt and debris out the waste line. Once the filter is backwashed (cleaned) of dirt, the control valve is manually resequenced to rinse, and then filter, to resume normal filtering. Looking for a cover saver pump? Need to remove standing water from your pool or hot tub cover? Click Here for more information. 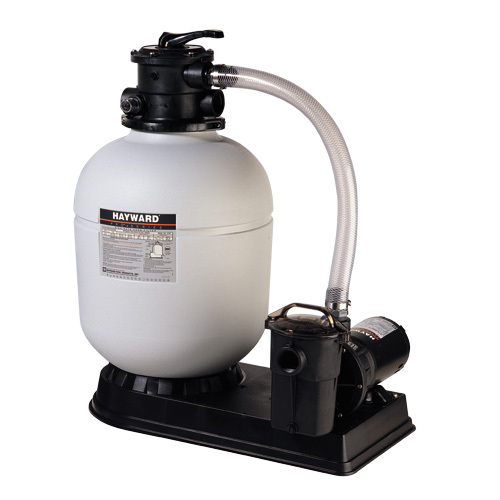 How do I operate & clean a Sand Filter? Filter- Set valve to FILTER for normal filtering. Also use for regular vacuuming. Backwash- For cleaning filter. When filter pressure gauge rises 8-10 PSI above start up (clean pressure). Stop the pump, set valve to BACKWASH. Start pump and backwash until water in sight glass is clear. Approximately 2 minutes or less depending on dirt accumulation. Proceed to Rinse. Rinse- After backwashing, with pump off set valve to RINSE. Start pump and operate for about 1/2 to 1 minute. This ensures that all dirty water from backwashing is rinsed out of the filter to waste, preventing possible return to the pool. Stop pump, set valve to FILTER, and start pump for normal filtering. WASTE- To bypass filter for draining or lowering water level and for vacuuming heavy debris directly to waste. 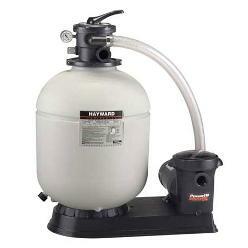 RECIRCULATE- Water is recirculated through the pool system, bypassing the filter. CLOSED- Shuts off flow from pump to filter. 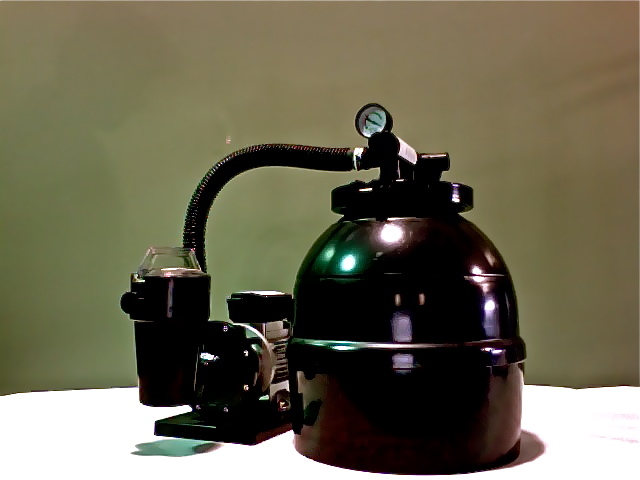 VACUUMING- Vacuuming can be performed directly into the filter. When vacuuming heavy debris loads, set valve to WASTE position to by pass the filter and vacuum directly out to waste. How do I operate & clean a Cartridge Filter? Be sure filter drain plug is closed. open manual air relief valve a few turns and open the suction and return valves (when in use). Be sure locking ring is secure (hand tighten only slight pressure is required). 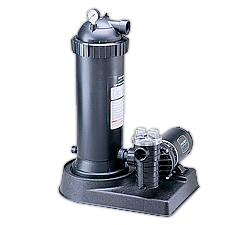 Stand clear of the filter and prime and start the pump, following the manufacturer’s instructions. Air trapped in the system will automatically vent to the pool and out air relief valve as soon as air is vented. Filtration starts as soon as flow is steady through the filter. As the filter cartridge removes dirt from the pool water, the accumulated dirt causes a resistance to flow. As a result the gauge pressure will rise and the flow will decrease. When the pressure rises 7-10 PSI above the starting pressure, or when flow decreases below the desired rate, clean or replace the filter cartridge. If filter is located below water level, close valves (or block suction and discharge lines) to prevent backflow of water from the pool. Unscrew and remove drain plug and allow water to drain from filter. Close drain plug. (Note: to assist draining process; open air vent a few turns). Unscrew and remove locking ring (counterclockwise direction). Carefully lift off top cover to gain access to filter cartridge. 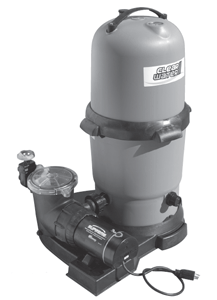 Clean any collected debris from the bottom of filter body. Carefully replace cartridge element into filter body ensuring that the cartridge sits evenly on the collector hub in the bottom of filter body. Tighten locking ring in clockwise direction. The cartridge filter element can be cleaned by pressure washing inside and out with a garden hose. After hosing the cartridge, for best results, allow cartridge to dry and carefully brush pleated surface area to remove the particles. Algae, suntan oil and body oil can form a coating on the cartridge pleats which may not be thoroughly removed by hosing. To remove such materials, soak the cartridge in a solution of filter element cleaner. Follow manufacturer’s direction for use and allow an hour for soaking. Hose thoroughly before reinstalling in filter. Vacuuming can be performed directly into the filter whenever needed. Clean cartridge after vacuuming, if required. In Michigan where sub-freezing temperatures can be expected, the filter should be drained and/ or removed from its operating location and stored indoors. Remove and clean cartridge. Reinstall cartridge in filter tank. Tighten locking ring only a few turns when storing. Each tank is individually test to ensure quality & reliability. Sta-Rite has put is engineering excellence into producing a high quality, yet economical cartridge filter system for your above-ground pool. 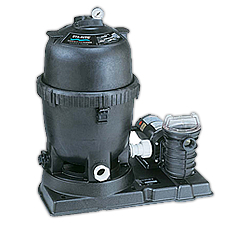 Cartridge filtration produces water quality that is far superior to sand and eliminates water-wasting backwashing. 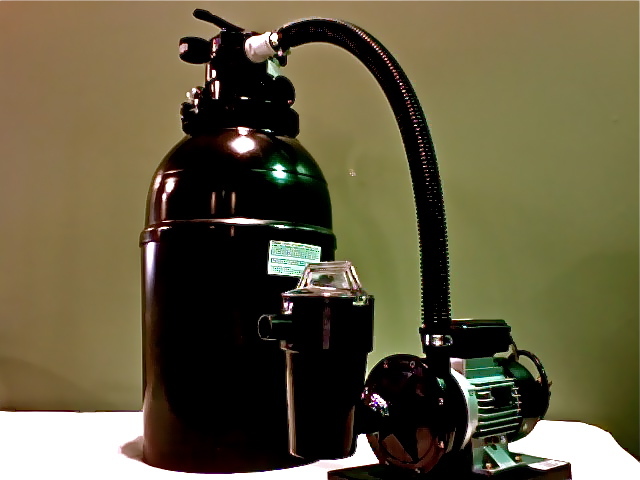 The Mod Media’s filter is specially designed to handle 15 times more dirt than an equivalent sand or cartridge filter. It can handle so much dirt and continue to operate efficiently, that you will only have to rinse the cartridges once or twice per season. Plus, Mod Media cartridges last for many seasons, eliminating the hassle of replacing sand every other year.